The DoD and NASA have been victimized so long by the Primes’ approach that the real cost of what it actually takes to build and qualify a launch system—particularly one built and dedicated to lowering launch costs—has long been lost. A New Commercial Space company such as Interorbital starts its design phase by learning how to work within the constraints of a limited and sometimes nearly non-existent budget. The component, or engine, or ground support unit has to be cheap or the company cannot afford to build it. However, Big Aerospace and the agencies who serve it never look back, never think of cost-cutting, and continually feed the fires of doubt and fear by claiming that less money will make a rocket system unsafe. So far, that line has worked well for them to keep launch high-priced and ‘safe.’ This has been to the detriment of those trying to make a price-point breakthrough by developing a dedicated smallsat launcher and delivering the benefits of low-cost space access to all, particularly the not-so-well-heeled groups of cash-strapped students and struggling experimenters who are just entering launch-world. Interorbital answered those questions by creating a design, manufacturing, testing, qualification, and launch philosophy based on Aerospace Corporation’s 1960s breakthrough study on Minimum Cost Design; by following instructions given by John London III, in his iconoclastic book, LEO on the Cheap; by adopting mass-production of identical modules to produce a rocket that could be configured to meet any mission requirement by adding modules, such as Lutz Kayser’s OTRAG. Components of the approach were then added that are used by the Subtractive Design architectural movement and by adding elements of manufacturing processes from the ship building, locomotive, and automotive industries to create a Minimum-Cost/Minimalist design approach. The key to this take on design is to perform a phenomenological reduction on the system—to strip-down rocket design to its essentials, then combine and apply some of the best manufacturing approaches from past players who tried to build rockets that could and would, if allowed to flourish, bring launch costs down. If, through history, people have proposed cost-cutting methodologies and designs, why are launch prices still so high? Perhaps the question should be, “Were these innovations even accepted?” Because the Space Industry is a multi-billion dollar behemoth, no one involved at the high-dollar end wants any upstarts rocking the boat with cost-lowering approaches; there are consequences (the engineer who invented Minimum–Cost Design was made into an ‘un-person’ and removed from the public eye). A New Commercial Space company such as Interorbital expects backlash and significant resistance from the major players who would like to suppress anyone who would dare to disrupt the global launch cartel, with its price–fixing and 100 mile-high barriers to entry. Surprisingly, the brainwashing that campaigns against commercial space entities experience has been so thorough that even potential customers who could benefit by having another, cheaper, launch vehicle in operation have, for the most part, bought into this charade. The favorite killing ground for a truly transformational project is the proposal review process. Many in the alternative space movement were convinced that government agencies gave contracts to commercial companies who presented ‘paper’ or ‘PowerPoint’ rockets—stuff that looked great to an office worker, but would never be built or were obviously doomed to fail if examined in any great engineering detail. These were the projects selected to win development awards as representatives of the commercial space sector—projects that would fail and be used to discredit the whole New Commercial Space community. That practice remains alive today. Loading smallsats into Interorbital’s CPM. Photo is courtesy of Interorbital Systems (IOS). When, on the one hand, a potential government customer requests that industry create a breakthrough, game-changing innovative launch vehicle that will dramatically lower launch costs for the new class of smallsats, while on the other hand, that same entity complains that the ‘offeror is not following standard industry practices,’ or ‘knows nothing about what it costs to create a launch vehicle’ in accordance with those same undefined ‘standard industry practices’ that triggered the current escalating cost-spiral of anything bearing the name ‘aerospace,” something is definitely amiss. For companies with viable and logically designed low-cost rocket systems, a whole other damnation practice is applied to keep their lower cost, positive showpiece, launch vehicles off the market. Interorbital has actually been told during a review that flying a launch vehicle is not considered a proper way to validate a rocket. The truth is: Commercial Space is a new industry with a new set of standard practices. In fact, many of the ‘new’ standard practices IOS has adopted are those of the pre-Shuttle days when the first wingless rockets were being invented and qualified. The Interorbital team has drawn on the best of these practices from concepts and companies that were attempting to break the stranglehold of the Primes and actually build a low-cost launch vehicle that enables space access for the student, scientist, inventor, artist, musician, soldier, space traveler, and anyone else who was creative enough to find a use or need for an on-orbit platform or trip above the Karman line. The operative message here to aspiring rocket manufacturers: Don’t depend on the government for your development and operational funding—raise your own money and go purely commercial. Interorbital has done it, and it works, without a helicopter ‘customer’ hovering over your every move. To bring value to customers, IOS created and offered personal satellite kits with an eye to a launch on the rocket system the company was already developing to specifically serve the smallsat market sector. The NEPTUNE modular rocket (available as an N5, N9, and N36) has been called the Holy Grail for the smallsat industry. NEPTUNE is the missing link—offering inexpensive, quick-turnaround launch... and lots of launch. Pre-flight qualification run of Interorbital’s 7,500-lb thrust main engine. Propellants: Turpentine/Nitric Acid. Photo: IOS. NEPTUNE will enter the orbital transport market in 2016, and during the current flight test phase, already serves the suborbital market with numerous satisfied customers. Most of these customers are already repeat-booked on all upcoming IOS suborbital and orbital flights, with a total of 119 payloads on the manifest. Hundreds of smallsat companies have sprung up around the world; the center of their business are the affordable picosats (CubeSats or TubeSats)—for less than the price of a used car, a budding entrepreneur can build and launch (with Interorbital) his or her own space anchor in orbital commerce. This democratization of space seriously ‘messes with the rice bowls’ of the entrenched mega-aerospace corporations and space agencies that launch a majority of industry’s and government’s satellites. In many cases, the government agencies and DoD simply don’t know how to—or even if they should—interact with New Space companies—or, as the John London affectionately refers to IOS and a handful of others, “representatives of the radical rocket underground.” Radical? Absolutely, bent on bringing launch costs down through any means necessary. 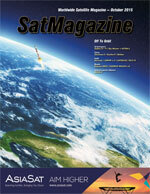 The problem: No low-cost launches for smallsats. The solution: Create a low-cost rocket... Photo: IOS. Why should those who are tall on promise, but short on resources continue to strain to prop up the existing extortionate price structure? When that type of ‘standard’ launch operation is the only game in town, that type of price abuse will continue. Those posing this question are the people and companies that are the core of IOS’ customer demographic: high potential/low-resource. 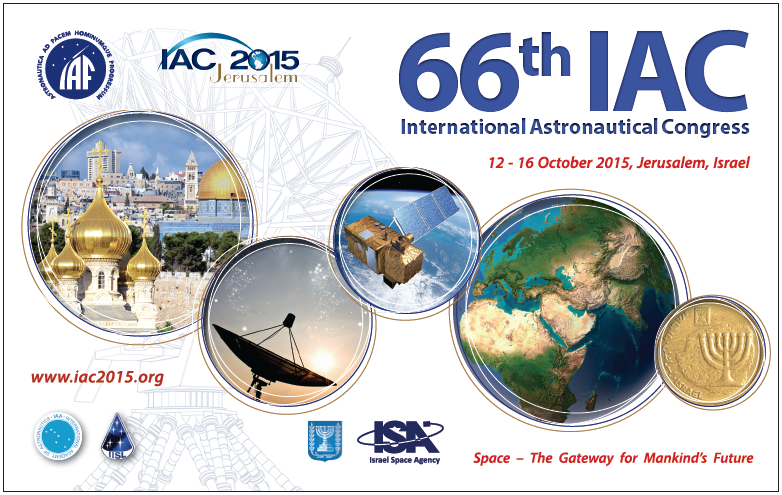 Interorbital serves the undeserved. The NEPTUNE launchers will open orbital participation for many who a few years ago could not even consider the possibility of engaging in what was prohibitively expensive space-based science. The low-cost, rapid-response NEPTUNE will also make life easier for NASA, DoD, and other Government entities, domestic and global: more frequent launches; low academic pricing; high-capacity payload opportunities for U-Class sats, if they can learn how to cut the red tape and buy launches from New Space entities. Remember the FEDEX analogy for sending a payload to orbit? Bring it to the launch provider, weigh it, sign your disclaimers and attestations, pay your freight, go back to the lab and get ready to download data from your sat that will have been launched on the next available flight. This is a beautiful model and one that Interorbital espouses. Government agencies could take a lesson and realize that the dedicated, small launch industry is made up of ‘space truckers’—its transportation that matters—and they are customers, buying passage for freight. Customers don’t ask for 100 page reports about how the truck is managing after an afternoon of deliveries, or require the design specs of the truck’s transmission, before assigning their payload for hauling. This is what space launch operators encounter when dealing with bureaucrats who simply don’t know how to behave as customers. 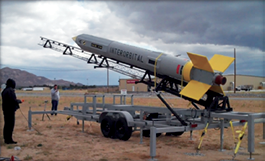 Interorbital’s CPM on Mobile Launch Unit. Photo: IOS. With the NEPTUNE’s imminent entry into the launch market, the time for scientific experimentation in space is now—launch booking companies world-wide can offer satellite customers the affordable rides they’ve been waiting for—think of the scientific advancement that will come from these new operators, many of whom have or will start their own STEM-based companies based on building that first satellite and sending it to space. Accept the risk, activate your program—and ascend. Interorbital Systems (IOS), founded in 1996 by Randa and Roderick Milliron, designs, develops, and manufactures spacecraft and orbital space launch vehicles (SLVs) for both cargo and crew. A one-stop-shop, Interorbital also provides end-to-end space launch services, including licensing and mission design. IOS is headquartered and maintains manufacturing, prototyping, and rocket engine test facilities at the Mojave Airport and Spaceport (MASP), in Mojave, California. The company’s current focus is to serve the smallsat industry by creating a new generation of mass-produced modular rockets called NEPTUNE. A completely new mental attitude is required to build launch vehicles that are truly different. To try to create or even copy an existing launch vehicle in a conventional way, using conventional means or ‘standard industry practices,’ while paying extortionate ‘aerospace’ rates to approach the problem like nearly all conventional space companies have done to date, will simply not get the job of lowering launch costs done. Adoption of a completely new approach in the philosophy of aerospace design, manufacturing, testing, and launching is required in order to effect a sweeping change in the industry’s mindset of risk-aversion and ultimately, of propping up the existing launch-cost price structure. In the modular NEPTUNE orbital rocket system, launch vehicles are built using the primary component of all N-System rockets: the Common Propulsion Module (CPM). A CPM is composed of a single gimbaled bipropellant liquid rocket engine, a valve unit, two propellant tanks stacked in tandem, a pressurant tank and regulator, a CPM controller, and an optional bipropellant thruster steering unit. The CPM is the testbed and basic building-block for all IOS vehicles. It is cheap to build and can be used to prove rocket systems in flight. Multiples of these modules are bundled to create a complete orbital launch vehicle. IOS’ propulsion team has also developed solid rocket kick-motors for orbital-stage insertion, and small COTS solid-propellant spin-up motors. 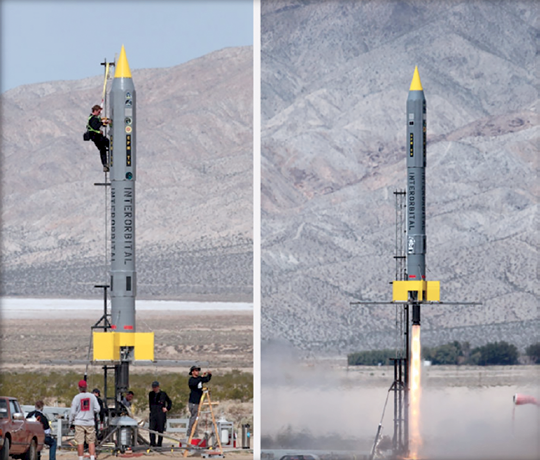 After two-years of intense rocket engine and systems ground testing and qualification, Interorbital’s CPM was successfully flight tested on March 29, 2014—and was flown with completely American-made engines. IOS will start orbital service with its NEPTUNE N9SM4 modular launch vehicle variant in during the 2016 to 2017 timeframe. This rocket system is capable of launching at least 75-kg to a 425-km circular polar orbit. That translates to carrying between 40 and 50 CubeSats and/or TubeSats per launch. IOS proposes possible launch dates as early as August of 2016 for its 5-module NEPTUNE 5 (N5)—30 kg lift to 310 km---launch-license dependent. Price: $1 million. 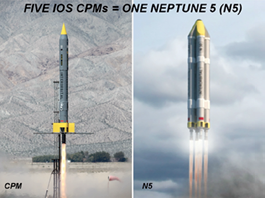 Orbital service with IOS NEPTUNE N9SM4 (N9) modular launch vehicle variant is projected for early 2017. The N9 rocket system is capable of launching 75 kg to a 425 km circular polar orbit. That translates to carrying between 40 and 50 CubeSats and/or TubeSats per launch. Dedicated launch price: $2 million. Both the N5 and N9 are dedicated smallsat launchers expressly created to provide economical space access for multiple CubeSat/TubeSat 1U to 4U payloads. Late in 2017, the Google Lunar X PRIZE Moon launch of the NEPTUNE 36 (N36) for Interorbital’s GLXP Team, SYNERGY MOON, will occur. The Modular Mind-Set Design Advantages: Interorbital launch vehicle design criteria are the direct result of the application of Subtractive Design combined with a Minimum Cost Design manufacturing approach, therewith producing breakthrough, game-changing technology that will alter the price and launch scheduling structure of the global space launch industry. The best way to reduce cost and failures of components and subsystems is by their elimination or subtraction. Compared to conventional rocket technology, an IOS CPM-based launch vehicle has increased reliability, reduced cost, and by far, less parts—which translates into a safer and less parts to fail agenda. Image is courtesy of Bryan Versteeg. This new approach to rocket design and manufacturing must be done by an unconventional, innovative, new commercial space organization such as Interorbital. A calcified, lock-step, giant aerospace company could not create a low-cost, smallsat launcher because there wouldn’t be enough time in the universe to get all the managers’ permissions to complete such a project. IOS is a long-time advocate of subtractive design, of radical simplification of systems, Spartanization, and Minimum Cost Design (MCD) and applies these philosophies, to enhance best practices from the entire history of aerospace development. The company employs and blends methods from industries other than aerospace to achieve a fresh look at how to build rockets, launch rockets and run a rocket company. MCD emerged as a direct attack on the waste, fraud, and abuse rampant in the aerospace contracting sector during the 1960s. Many of those in the business have, year after year, decade after decade, watched with disgust as funding went to vaporware projects, to regurgitations of failed, glitzy forgotten (and previously rejected) concepts from the past, watching as new con-men thrived by banking on the public’s inability to recognize the re-packaged pork-barrel projects of bygone ages. Stepping into the commercial arena with a truly ‘different’ space launch vehicle is always a threat to those individuals who are looking for the fast buck, but the new vehicles offer hope for those seeking space-lift based on logical design and prudent con-ops. IOS had a choice: try to build a rocket that imitates the conventional rockets in use today and end up with just another highly complex and unaffordable launch vehicle, or to follow the Steve Jobs’ mantra, actually ‘Think different’ and really create something that actually is different. Interorbital did, and the result is the NEPTUNE launch system. Don’t fear it—embrace it… exactly what the smallsat industry needs. Interorbital’s kind of thinking produces a practical ‘service’ rocket: less sleek, but stronger—not a racehorse, but a workhorse that approaches reaching orbit as a brute-force endeavor. IOS’ approach is radical, unorthodox, risk-tolerant, iconoclastic, and truly game-changing. The NEPTUNE rocket is approaching operational readiness and it is here for the taking. Its very existence answers government’s mandate to introduce lower launch prices and provide more frequent launch opportunities. In addition to these hardware-related cost-cutting measures, IOS has determined that low launch costs can only be achieved if the launches originate from private spaceports or from the ocean. IOS has been quoted launch costs from US ranges including Vandenberg, Wallops, and Kodiak, in the two-million-dollar-plus range, with the extra negative of long scheduling delays. Because of the terrifically expensive and concentrated space launch assets at the Cape and Vandenberg, insurance costs may remain tremendously high because of the infrastructure that could be impacted in the event of a launch failure. For the low-cost launch provider, high insurance is too much of a cost-driver. IOS rockets are designed to launch from unimproved land sites or from the ocean, areas devoid of infrastructure, traffic, and people. The Vertical Ocean Launch System solves a multitude of these problems, significantly diminishes launch and operational costs, and allows IOS to provide true rapid-response launch-on-demand. 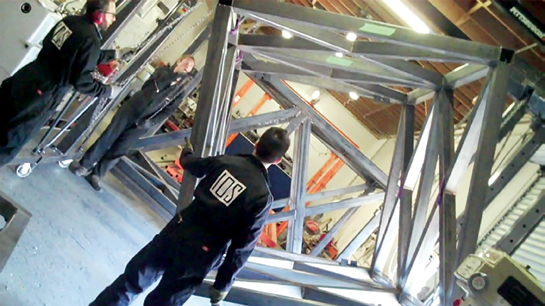 From its inception, Interorbital’s goal has been to create the world’s lowest cost launch system. The founders of Interorbital Systems responded to the complete lack of space access experienced by the private–sector scientific and academic communities: launch was only for the rich; only for the military; only for Government; only for a small cluster of mega-corporations; and only accessible at enormous cost. Definitely a closed-door policy to those not already hooked in and able to jump the highly restrictive entry requirements. People often talk about democratizing space—well, Interorbital is already doing it. IOS’ first commercial launches have given two satellite companies a jumpstart on their business operations. They are now bringing their own clients to IOS for launch. This is a pattern IOS sees repeating with a majority of its clients. The buzz has started and Interorbital is interacting with new and repeat customers every day, selling satellite kits and booking launches in ever-increasing numbers—without advertising. How does Interorbital keep costs down? The company does not out-source propulsion systems. IOS builds its own engines and does not buy expensive foreign engines, nor engines from other domestic manufacturers. Interorbital’s founders believe that all key components should be produced in-house to insure economic freedom and price control of the most vital of launch vehicle components. Interorbital uses only American–made rocket engines, made by Interorbital itself. IOS saves by keeping its prototyping and launch teams small. 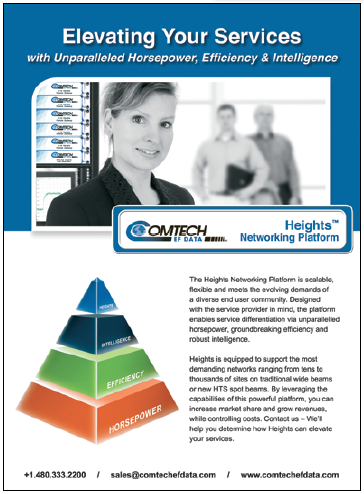 The company does not have massive overhead or immense salaries. If IOS were to simply follow the standard industry practices of the huge corporations and build to the highest spec possible, or even to build a copy of an existing conventional high-complexity launch vehicle, no cost savings would be possible. IOS would return to the stalemate the industry currently finds itself: lots of payloads to launch and no one to launch them in an affordable manner. Several commercial providers have thrived in what was touted to be a new era of risk-tolerance—an era that was all-too-brief before the undertow of strategic gossip started. The mania and hysterical finger-pointing that resulted from the two recent SpaceX and ATK/Orbital accidents is just another example of how the anti-commercial space propaganda machine works. Even though these two companies have respectable track records of launch success, and there is always a probability of eventual launch vehicle failure; there exists a component in service to the Status Quo that faithfully chants a message to keep the public mind focused on the risk and danger of any new rockets. That message is that New is bad. New might blow up. New means the contract might not be satisfied so let’s not try anything New at all. Let’s keep paying millions and billions to be safe with the not-New. If government wishes to have the low-cost launcher it keeps asking for, if there is really a new attitude in the various agencies, that means they would consider actually tolerating additional risk in order to try launch systems that solve the problem of ride scarcity in the CubeSat community. The government must also be courageous enough to take a chance with a new approach that has the potential to bring immense breakthroughs in space access for all. NEPTUNE is the launch system that will provide the smallsat community with rapid-response passage to orbit for an ultra-low price-point that was heretofore undreamt of. IOS has intentionally built its rockets to serve the smallsat market. Perhaps it would be a good example for space agencies worldwide to exercise as much boldness as the 119+ launch customers on Interorbital’s launch manifest have done: taking their place on a new launch system and choosing to fly over not-flying. The other option for seekers of launch is to live paralyzed by fear of failure and never launch at all. It’s time for government to man-up. Entering the Space Biz is an order to be brave—to venture, to dare, to put skin in the game, to take a chance, to be like Jobs and think ‘different’—taking this well-calculated leap into the unknown is the only way to activate the much anticipated paradigm shift and promise of Space 2.0.